Below is some of our information on the Alaskan Malamute. Are you sure a Malamute is what you want? Check out the REALITY, here, of sharing your life with this breed! 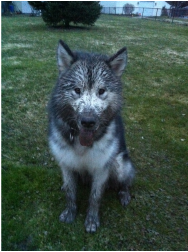 Alaskan Malamutes are NOT a dog for everybody. These are large, strong dogs. They shed a lot. A LOT. Hair everywhere! Like to wear black, or dark blue? You can continue to do so but I have to recommend some really good lint rollers... Malamutes are NOT known for their ability to get along well with other dogs- that said however, mine generally like most friendly dogs they meet. This has a LOT to do with how much socializing they get as puppies- if they meet a lot of different types of dogs, and *important* have good experiences with those dogs, they will usually grow up with a greater regard for many dogs. SOME Malamutes can be bossy, domineering dogs- earned respect is highly important to these dogs- it does not take strength or aggression or heavy-handed training methods to make a respected owner and trainer- it takes BRAINS, and fairness. If you are not clearly taking charge and ensuring your dog feels safe from bullies, or annoying pests, or any uncomfortable situation- - your Malamute will decide maybe he's the one that has to make all decisions and protect himself. Some Malamutes never care to worry or stress and are just calm and cool, others are the "take advantage" type from puppyhood and spend their lives trying to outsmart you! (like my Stony was) Puppy Temperament testing, as well as constant observance in interaction with each pup as the litter grows, helps to figure out which puppies will lean toward which end of that spectrum, but everything can be influenced by early life experiences. Malamutes are highly intelligent dogs- however their development and history required them to be smart enough to make better decisions than their humans, and determined enough to override the demands of those humans- the lives of dogs and people often depended on this ability. Malamutes were originally kept by the Mahlemut tribe of Arctic natives, assisting them in many aspects of their life in harsh conditions. Mals were employed to help haul sledges of belongings as the groups moved from place to place, to haul the results of successful hunts, to aid in those hunts- often alerting their people of the approach of seals or smaller whales to established blowholes in the ice...Mals, so we are told, aided in hunting (or protection from) Polar Bears, and for caribou or other prey. History also tells us these dogs were turned loose to fend for themselves in summertime. Malamutes were often among the children of their people, and the breed is usually very fond of children to this day- however, NO large dog should ever be left alone with small children- their sheer size and strength could lead to unintentional injury. And there are always exceptions to the rule- not EVERY Malamute will enjoy children- it is up to us to know our dog. To survive in the native environment that formed them, these primitive-type dogs had to be intelligent, confident, strong-minded as well as strong-bodied, bold and opportunistic. Today, they are predatory, cunning, and often sneaky or bossy. Most Malamutes would make poor guard dogs, as they seem to have never met a human they didn't like! Mals rarely "Bark", but they are by no means silent, "speaking" in various tones of howls, moans, growls, and "woo"s...usually if they want to tell you something, or ask for something (Stony had a story for me every day- and quite a story it was! 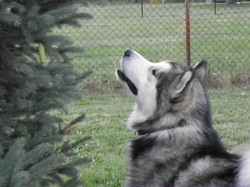 )- sirens always set my dogs off into song, and sometimes they enjoy a morning "chorus", just to rejoice in being a Malamute! When not having a sing-a-long or telling us about something, they ARE very quiet, and brief visitors to our home often aren't aware they are there. Malamutes hunt. I agree...yes, they do. Malamutes shed. WOW, do they shed!! Malamutes need a JOB to do. ABSOLUTELY! A bored Malamute is a destructive Malamute! This can be a big job, such as a daily sledding excursion, or a smaller one, such as a daily walk and some training sessions- whatever it takes to burn energy and exercise the mind! 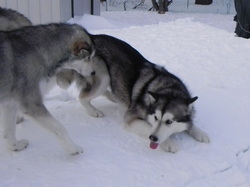 Malamutes need a smart, fair trainer/owner. Again- YES! As a primitive dog, Mals behave and read body language very readily- they respect kind but fair treatment. A Mal will not tolerate rough or abusive treatment- they will either "shut down", or react defensively and violently. I don't blame them. Treat your Malamute right, and they will treat you right. Malamutes HATE repetition. Make training fun and interesting, don't waste time rehashing something they've already done right- they'll get bored and disinterested, fast. By the way- you don't have to become a "cookie dispenser", but Malamutes like to be paid- they don't work for free.